Nighttime dreams rarely inspire my stories, although who knows what devilish romps my imagination is having! I do spend too much time day-dreaming about rewriting my life story (Oh, the things I’d do better! ), and how I would spend the million-dollar windfall I’m expecting any day now. I dreamed last night about a chunky little chihuahua that was licking my feet from the bottom of a swimming pool. I fell in love with her immediately, even though chihuahuas are my least favorite dog. But she was about the same size as my 20-year-old cat who just crossed the rainbow bridge a few weeks ago, so maybe that was the attraction. I’ve been writing all my life, winning my first award at age ten. There was a long hiatus, while I raised my children and had a career in the technical industry, although I never totally stopped writing. I produced such sleep-inducing tomes as Exploring IBM e-business Software. 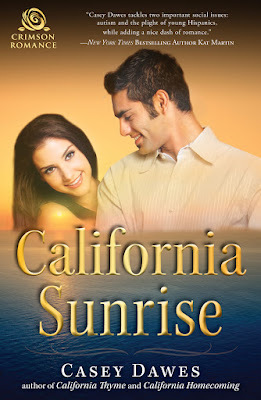 In 2012, I received my first fiction break-through when Crimson Romance published California Sunset, a contemporary romance about a woman who’d been laid off from her high tech job, as I had been. California Sunrise is the last in the five-book California Romance series that began with California Sunset. My readers had been clamoring for Alicia’s story, and this is it. Alicia is a single mom with a difficult child, who specialists may believe is on the autism spectrum, but it’s too early to tell. In the course of seeking help for her child, she meeting Raul Mendez, a pediatrician with scars of his own—his family was deported when he was fourteen. Despite their baggage, they begin to care about each other, although differing points of view on some issues threaten to derail their burgeoning romance. Although the book is part of the series, it can be read as a stand-alone. I had many inspirations! A good friend has a child who is on the autism spectrum. Although he is now in his thirties, he still struggles and always will. I watched my friend doggedly try to find help for her son at a time when no one really understood what was going on. I wanted to honor her effort. I spent over a decade living near the Salinas Valley in California and saw the effort and toil farmworkers expend to grow our food. My husband and I did a few books on the wine regions in that area, and became even more aware of the labor intensive processes. One of my friend’s had been involved in Cesar Chavez’s farm worker organization, which eventually became the UFW. She introduced me to Doctor Ramon Resa, author of Out of the Fields. Dr. Resa graciously allowed me to base my hero, Raul Mendez, on his life. Finally, I watched an interview with Diane Guerrero of “Orange Is the New Black.” She told of coming home from school one day to find her family had been deported, and the ramifications of that. So, needing to add more angst to my doctor’s life, I added that burden as well. I’m a fairly eclectic reader! The last two books I read were Tombstone Courage by J.A. 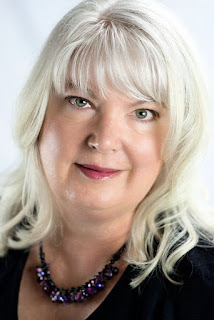 Jance, and French Lessons by Ellen Sussman. I have a Master’s Degree in Theater from the University of Michigan. I’ve got two novels going at the moment. One is a Christmas story between a woman starting a chocolate shop and a man in uniform—an airport cop/firefighter/medic. It takes place in Missoula, Montana, where I live. The second is the beginning of a series of a ranch family up by Choteau, Montana (near where David Letterman lives). A Viking River cruise down one of Europe’s rivers.